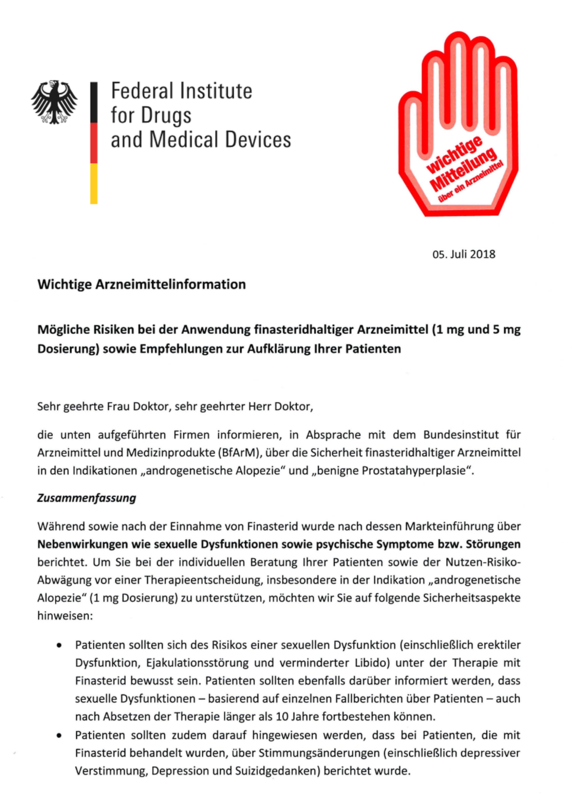 Apparently heeding an appeal by Germany’s largest weekly newspaper, the Federal Institute for Drugs and Medical Devices (BfArM) has dispatched a so-called Red Hand Letter to doctors and pharmacists nationwide, informing them of severe and persistent adverse drug reactions (ADRs) to finasteride. The EMA, which is comprised of 31 member nations, issued its first finasteride label-change mandate in 2017, noting that new risks include depression and suicidal ideation. A year later, based on reported cases, it added anxiety to the list. We thank BfArM President Karl Broich for taking action in response to ADR reports filed by German PFS patients, including 54-year-old Franz Fuchs, who hails from the town of Konzell. Franz recently shared his story with the Swiss health-news magazine Puls, for a special report titled Do Anti-Baldness Remedies Make You Impotent? We remind all PFS patients who have not yet done so to report their symptoms to the FDA’s MedWatch program as directed here. Those living outside the US should access the WHO’s Collaborating Centre for International Drug Monitoring list of pharmacovigilance agencies, as well, and report to their respective health agency.